Engineer's boss gave us 3 gallons of eggnog at Christmastime. What am I to do with 3 gallons of eggnog? The answer was what any self-respecting frugalista would do - find a way to make it work! Instead of letting all that dairy goodness go to waste, I had to get a little industrious and find ways to use it up before it got all curdled and unusable. Eggnog bread was the first of many experiments. Eggnog bread is fairly dense and isn't overly sweet. You don't dirty up every bowl in the house making it. It's made with ingredients you have on hand. This truly is a great way to use up a bottle of eggnog. The eggnog bread made for a wonderful tea time treat hot from the oven and slathered in butter. I think it would make for a gorgeous base for bread pudding but I wouldn't know for sure since the loaves didn't last long enough around here to find out. If you have some leftover nog, consider making some bread. In your stand mixer's bowl, throw in the nog, eggs, sugar, rum, vanilla, and cooled melted butter. Turn mixer on a low setting and let it run while you mix the dry ingredients. In a large bowl, mix the flour, baking powder, salt, and pumpkin pie spice. Pour the dry ingredients in with the wet ingredients and mix just until combined. 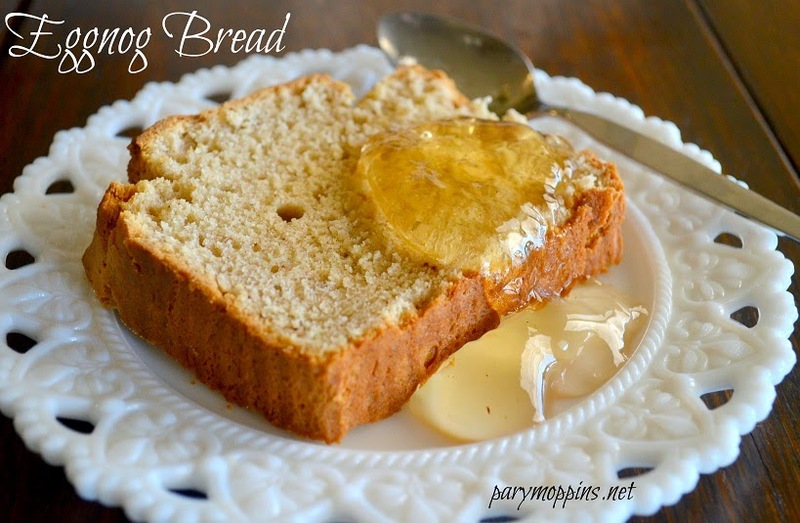 I've never thought of making eggnog bread, but it sounds delicious!